Here’s what I love about summer salads: their freshness, color, and simplicity. The thing I don’t love about summer salads is that they’re often a little less substantial than wintery ones. No matter how wonderful it is to dive into a bowl of really fresh vegetables and fruit, it usually takes some grains and legumes for me to consider a salad meal-sized. Greek salad is a good example. I’m crazy about the combination of tomatoes, cucumbers, and herbs, and the flavors speak to my heritage. But even if I find a way to replace the feta, Greek salad isn’t quite hefty enough to fill me up, unless I pile on the pita. 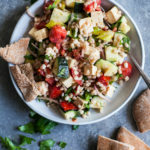 This vegan barley Greek salad with herbed tofu is a slightly more filling and nutrient dense spin on a quintessential summer dish, and it was love at first bite when I tossed it together over the weekend. 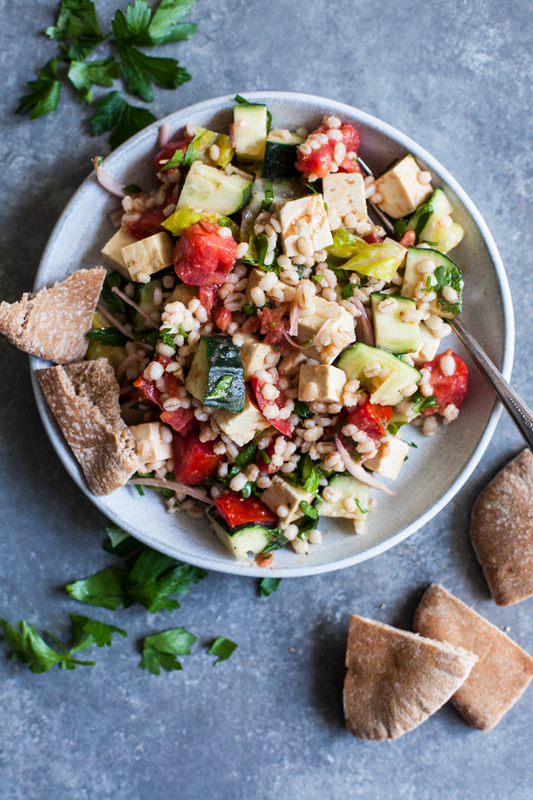 The key to this salad is a variety of textures: juicy tomatoes, crispy romaine and cucumbers, chewy barley, and dense tofu. It’s a great mixture, and—thanks to the tofu brine, the sweetness of really fresh tomatoes, and a simple Greek vinaigrette—it’s also packed with flavor. The herbed tofu feta here is a very straightforward variation of my regular tofu feta recipe—basically, I just added dried oregano. Fresh oregano is also fine, and you can get creative with your choice of herbs here: dill, thyme, and basil would all be lovely. You can make tofu feta with any salty marinade, but I really like using miso, because it adds some umami as well as salt. 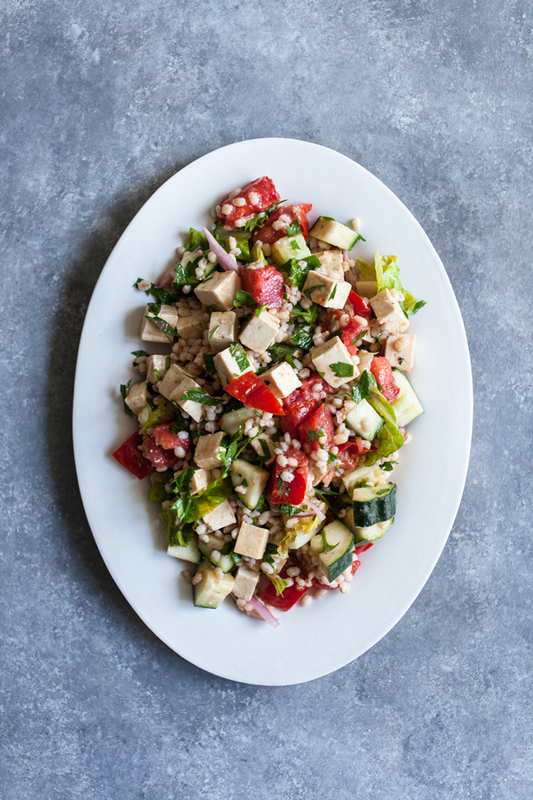 You drain the tofu of marinade before tossing it with all of the other ingredients, but a lot of the flavor remains, so the dressing for this salad can afford to be sparse. If you make the salad, there’s plenty of opportunity to play. You can use cherry or grape tomatoes in place of beefsteak, add herbs other than the parsley and mint I used, load on the olives or capers, etc. I recommend tossing it and serving it right away, but if you need to store it in the fridge for an hour or two, that’s just fine. Prepare the tofu feta about 4-8 hours before making the salad (I think it's easiest to prepare it the day before and allow it to marinate in the fridge overnight). In a small mixing bowl, whisk together the miso, lemon juice, and vinegar; you'll have a thick, smooth paste. Add the water and whisk till smooth, then whisk in the garlic, nutritional yeast, salt, pepper, and oregano. Place the cubed tofu in an airtight container (preferably one that's wide enough to allow tofu to rest in a single or double layer) and pour the marinade over the tofu. Shake to distribute the marinade over the tofu, then cover the container and transfer it to the fridge for at least 4-8 hours (preferably overnight). Cook the barley according to package instructions. Allow it to cool to room temperature before proceeding with the salad. 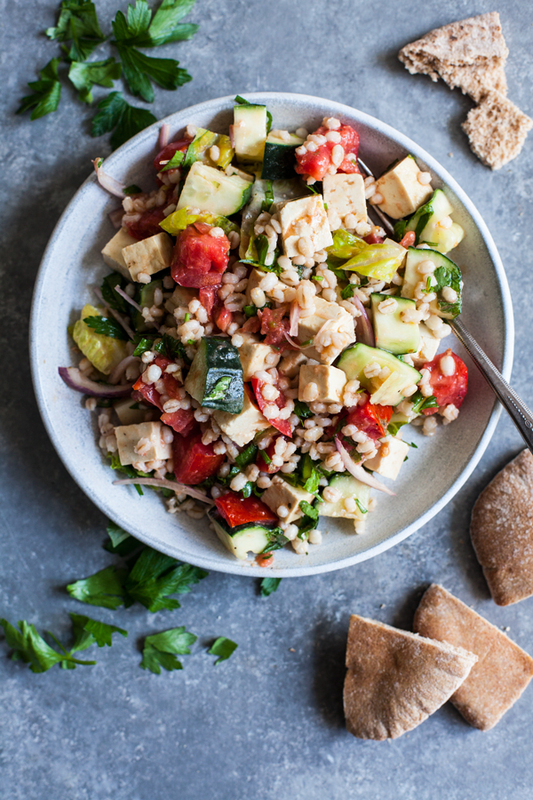 In a large mixing bowl, combine the cooked barley, tomatoes, cucumber, mint, parsley, romaine, and olives or capers if using. Drain the tofu feta of its marinade and add the cubes. In a small mixing bowl, whisk together the olive oil, red wine vinegar, salt, and pepper. Pour this dressing over the salad ingredients, and toss gently, until everything is well combined. Serve with pita wedges, if desired. I really love the tofu feta in this recipe, but if you’re allergic to soy, you can replace it with 1 1/2 cups of cooked chickpeas (a can, rinsed and drained before adding). For a gluten-free alternative to the barley, I’d recommend another toothsome and hefty grain, like rice or sorghum, but millet would also be good. 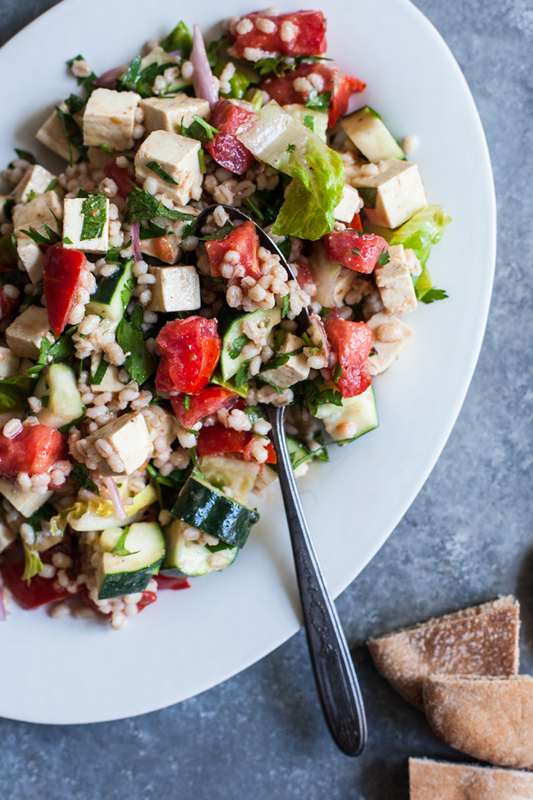 I tend to use pearl barley for its quick cooking time, but you can definitely use hulled barley in its place. I love increasing the texture and heft of salads with the additions of grains; in fact, these days I rarely prepare salads without some sort of whole grain or another. I’ll be enjoying this one many times over before the summer is over, and I hope you’ll enjoy it, too. I’ve got a busy week of new class and nutrition counseling ahead of me, but I’ll be checking in on Friday with a stellar, classic cookie recipe. Have a wonderful week! Beautiful! I just love feta. 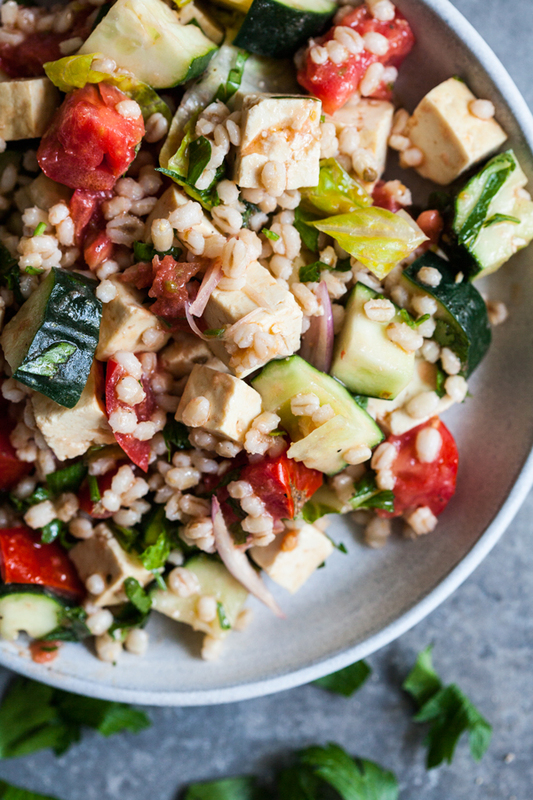 I haven’t had many salads with tofu & barley but I really love the flavor combo going on here! PS. I made with quinoa. Incredibly delicious! I will be making again…and plan on taking it to a potluck later this summer. Thank you. This is my kind of salad. I rarely eat barley so this is a fun way for me to work it into a meal. Can’t wait to try! Made this for a BBQ of vegans and omnivores and there were no leftovers, everyone loved it. I added 3 sliced pepperoncini and forgot the mint. Also a tip if you don’t have time to let the barley cool, you can put it in a mesh strainer and run it under cold water. This vegan feta. A. Mazing. Can’t wait to share with my vegan cheese connoisseur friend-and have some more myself!